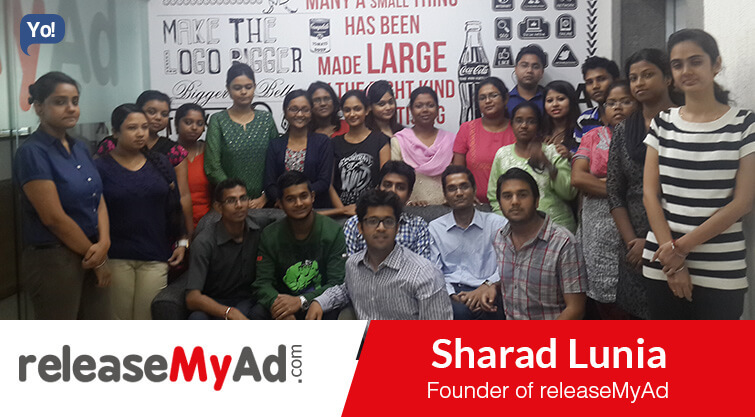 With an expertise in market research, business strategy, digital marketing and online advertising, Sharad has always been a creative thinker who takes the initiative to improve business for his clients and empowers his colleagues. He has excellent business acumen and most of his peers look up to him for his leadership skills. His is known for his brilliant interpersonal and communication skills, which has been the core reason behind his successful career. He started his career as a research analyst and gradually gained credence undertaking several roles in different companies. However, after some years, he started to mull the idea of launching his own company. This is where ReleaseMyad was born. It is aiming to become one of India’s largest Advertising Platform. It offers an online bridge to advertise effectively in offline media. It has severed 1.5L+ Advertisers, small & large. Media Discovery: A mass media campaign’s success greatly depends on selecting the correct media option. We help our clients discover the right media option for their objective by offering over 212 Newspapers, 27 Radio Stations, 19 Multiplex Chains, and all leading magazines. Lowest Pricing: Given that availability & pricing for Ads fluctuates widely with demand, we strive to drive the lowest price for every potential advertiser. To ensure this, we float the enquiry across multiple publishers & advertising representatives throughout India to obtain the lowest possible rates. Further, we monitor the historic pricing of Ads across clients, to better negotiate prices with the publishers in the advertiser’s interest. In the end, we manage to save a lot of money. Service Delivery: We ensure a glitch-free smooth run of advertisements placed across all ticket sizes. Our systems & processes enable us to service huge volumes of ad placements, otherwise not possible via any manual process generally followed by traditional media agencies. The idea of releaseMyAd as it stands today has evolved over time. My intention was to leverage my family’s advertising background and my own experience in advertising at Microsoft to create a completely tech-based online ad platform to serve advertisers at scale for offline media. A steady growth and a dynamic development of the business model led to the formation of a soundly functioning marketplace. U will never succeed by not trying. You must always be courageous enough to try to give effect to whatever you want. Without a sincere attempt, you could never tell if something is possible or not. Convincing the media owners It is no mean job to aggregate media options in 1 platform and then convincing media owners of the effectiveness of an online portal as a viable acquisition medium. Convincing advertisers to go online. Enable interaction via an online platform. As the platform grew in scale, it created the kind of value that could assuredly be used to leverage a business. Moreover, the buyer-seller network for media transactions is one of its kinds. Any advertiser would automatically gravitate towards a means that ensures concrete and guaranteed cost-benefits. We have scaled our newspaper ad business via bootstrapping. As we expand into other verticals and mediums serving more and more SMBs, we will consider fund-raising in alignment with the business model concretised. Our current operations are profitable and growing on internal accruals. We have a stringent selection process whereby we take in people willing to enjoy the startup culture. We have a flexible and consequently, satisfying work environment. Challenging responsibilities and a healthy team culture keep an employee empowered and interested in the work at releaseMyAd. Perseverance above all. The ability and desire to continually keep learning. A professional should always be nimble and agile, that is, willing to revisit his hypothesis as and when the company and the work environment evolve. Google apps for business, Asana etc. I believe in the importance of always keeping sight of the next achievable goal. Allocate work life balance better. It is very important to stay prepared and keep trying. Courting luck becomes easier that way. One must make a sincere attempt to be in the right place at the right time. Matching the right advertiser with the right media option: By building backend CRM systems categorizing advertisers based on their marketing objective, target locations, budget, requirement and advertising frequency. Efficient sale of last minute Ad inventory: We intend to improve our last minute inventory sales transactions thereby enabling better pricing for our advertisers. Iterative learning knowledge base: To recommend which media works for which objective and budget- standardized into packages. Dynamic Ad Pricing Data: We intend to maintain a dynamic internal ad pricing providing knowledge to help better negotiate lower prices from media owners for all our customers besides further aggregating SMB ad buying for which we intend to foster the RMA partner program and further develop the marketplace model that we have laid down. New york. Cochin. My Family farm.